Sessions and Sail is a voyage, a floating festival of Scotland's traditional music, communities, and the sea. The Lady of Avenel will set sail on a brand new Sessions and Sail voyage in 2019, exploring the music and long history of Orkney. Sail from Kirkwall Harbour on Sunday 12th May with a crew of musicians, led by Shetland fiddler/songwriter Barry Nisbet. 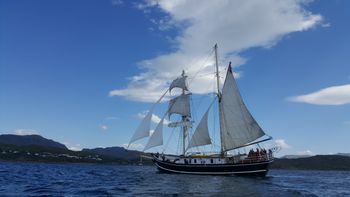 Twelve berths aboard the 100-foot-long brigantine ‘Lady of Avenel’ are available for musicians playing at any level, with an interest in Scottish music. Visit islands such as Egilsay, Stronsay, Westray and more; enjoy the incredible coastal nature and be inspired by the history of these amazing islands. Bookings are being taken now - email sessionsandsail@gmail.com to sign up!